A collective holy sh*t has probably dropped from every last one of you guys reading this. Or maybe not. Yes, you're looking at a Gran Turismo review that has scored, for the first time ever, nowhere near the practically perfect grades we've graced this franchise with since day one. Okay, maybe some of you have read some of the other reviews out there and are aware that something has gone really wrong. Well, first off, allow me to preface the remainder of this review by stating that Gran Turismo for the PSP has, allegedly, been in development for five years. I say allegedly, because I'm certain that the development cycle for the game had been temporarily sidelined numerous times in between all of the work Polyphony had to do for the PlayStation 2 and PlayStation 3. Gran Turismo's development was most certainly not a continuous effort of five years...and unfortunately, it shows. Now, after re-reading this review, it definitely comes off harsh, but with good reason. Gran Turismo PSP is a flawed game. But, on the other hand, I still had a lot of fun with it, as at its core, GT PSP is still very enjoyable, accessible, and fun game. I put in tons and tons of hours into the game just making money and collecting cars, which is one of the purposes of GT PSP. Many of these cars are transferable, allowing you to sync GT PSP to GT5 and transfer cars you've bought or won into your PS3 game. Again, GT PSP is a very fun game. But a "fully specced Gran Turismo", Kazunori Yamauchi said, this is not. The first major disappointment came when I realized the tiny little size of the game file Sony had forwarded me. 937MB? Gran Turismo 2 was a PlayStation 1 game and it boasted two separate discs, essentially making it a game worth 1.2GB. Okay, so I held out hope. So the game boots up, and immediately I run to the dealership to look through the list of amazing cars, only to realize I can only choose between Bugatti, Bentley, Chevy, and Polyphony. "Oh," I said, "Sony must've sent me a demo file accidentally. Oh, those crazy guys, I'll just contact them agai...what? This is normal?" You see, as the days cycle in-game, the dealerships you can browse through change, as do the cars you can buy. Allow me to explain in a bit more detail. When you boot up the game, you'll have four dealers to access and 100,000 credits to spend on a car, which is a gracious sum. Once you buy a car, you can participate in a few events. As the days roll on in the game, a new set of four dealerships will be made available to you. But, just because you can access a Nissan dealer, doesn't mean you can have the ability to buy any of their cars. No, no. If you don't see a GT-R or a 300ZX TT, you have to wait until the next time Nissan becomes one of the four dealers you can shop at and see if the assortment of cars features the ones you want. Yes, it's that complicated, confusing, and stupid. Some of you may say, "but Arnold, why didn't you mention this in your GT PSP hands-on preview? Why is this such a shock to you?" Because when I played Gran Turismo PSP a few months ago at a New York City event, I recall being able to sort through a complete listing of every car in the game, through every single make; none of this four dealers only bullcrap. So to see this absolute lunacy on my PSP, in a game I had so long waited for made me livid, quite frankly, as I'm sure you can tell by the tone of this diatribe. But things get worse, as GT PSP commits the ultimate sin, in my eyes. No customization. Sure, you can enter the game's Quick Tune menu and adjust suspension components such as camber, toe, ride-height, spring rate, and damper, but that leaves the other half of the gearhead spectrum (the straight line guys) alone in the dark. Yes, you can add some horsepower to your car, but you can only do it for drift trial mode. And you're not actually adding any components, you're just increasing a little slider that adds up to 20% more power to the car you're in. Honestly, I could sit here and ramble about how utterly stupid this is. GT has always been about taking a car and making it faster, in some cases, absurdly fast. I've spent dozens and dozens of hours in GT4 just taking random cars that I like in real life, buy every little component for them to see just how much of a difference it makes around a specific track and in the 1/4 mile. GT PSP has taken all of that away from me, and has left me with an open-ended single-player mode that allows me to choose a car, track, set the number of laps (1-120) and race on it against three others. Yes, the total number of cars per track is not eight or even six, it's four, including you. And once you win a race, you earn prize money, and then you have the ability of racing that same track three more times. You see, the first time you race, you race it on an easy difficulty rank called D. Once you win, you can race against C-rank racers, then B, and then A. The game boasts a total of 800 cars, but only 200-250 of those are actually unique models. And there are 35 tracks, with a total of 70 different layouts and variations. Unfortunately, there are some key tracks missing, most importantly, both Special Stage Route 5 and 11, series staples. I've also noticed that no aesthetic changes have been made to real life tracks such as New York City, to reflect their modern day changes. For example, the New York City track in GT4 depicted an area of Manhattan known as Columbus Circle (the roundabout portion), back when GT4 was developed and released, the area was under a lot of construction, so understandably the in-game track reflects that with cranes and such all around the area. But, five years later, Columbus Circle is brimming with beauty as the Time Warner building has been long finished...but unfortunately, the in-game track shows none of that detail, and instead looks precisely as it did in GT4. This tells me someone was forced to take away Polyphony's attention to detail and, in turn, forced to maybe...rush the game in time for the PSP Go launch? I'm not quite done, yet, though. You see, beyond the standard races are also the Driving Challenges, which are nothing more than License Tests in disguise, and are not a requisite here. Although, taking 15 minutes and completing a few set of challenges will unlock the custom soundtrack feature, and they are strangely addictive, as well. Moreover, they're good for accumulating a ton of money in a relatively short time-span. And if you really dig the challenges, upon completing them, the game will reward you with a whole new bonus set. Lastly, the multiplayer here is...well, disappointing. There is no online to speak of. None. Not even a meager two player battle. You're limited to four-player Ad-hoc, which is great and all, but finding someone, let alone three others, with a PSP and a copy of the game directly next to you is very unlikely. And I highly doubt you'll be making an event on Facebook inviting any would-be competitors to a multiplayer session at your house. Beyond a few new tracks and Professional physics loosely based on GT5's, Polyphony added little-to-nothing to make this GT feel fresher and revised. Visually, the game looks really great. It's running at 60 frames per second and boasts some really nice car models for a handheld title. It's not quite Gran Turismo 4 caliber stuff, but if the framerate was brought down to 30, it probably could've been. Regardless, beyond the slick car models and super framerate, do lie some visual issues. Seams break up and textures and polygons all over the screen frequently, and it's more noticeable in some stages than others. These seams are white lines that run across various parts of the stages, flickering about. Also, there is no light emitting from the brake-lights of cars, as it's just a red and flat texture that gets drawn on when you hit the brakes...cheap. Moreover, the rims are two-dimensional and paper-flat when in a race, which I thought ended with GT4, but I guess PD couldn't get even that going on the PSP. Again, all in all, this is a very good looking game, but it does fall short in a lot of places I didn't expect it to, and it kind of takes a lot away from the overall look and feel. Shame. The audio is acceptable, and you can hear that Polyphony put in a decent amount of work into the sound, especially when the PSP is running through an external speaker of some sort. The standard soundtrack is pretty good stuff, but the ability of a custom soundtrack is what I love most. Sound effects such as tires screeching and crashes are pulled right out of GT4, which is good and bad. It's good since they weren't that bad sounding to begin with. But it's bad because, well, not being bad doesn't mean they couldn't be improved on or made to sound a bit newer or fresher. 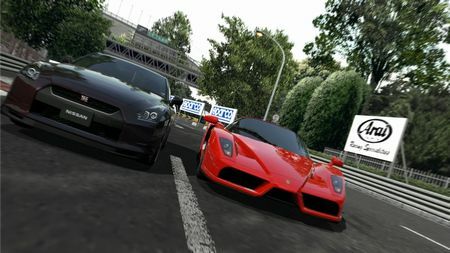 Also, I noticed that a lot of the cars don't quite sound like their actual counterparts, as their engine and exhaust notes don't roar like they should - I mean honestly, a Ferrari Enzo sounds like a wind-up car in the game. The American V8s sound burbly and nice, but a lot of cars with defining characteristics in their engine/exhaust notes are missing said characteristics. As you can see, I'm one of the few critics who isn't annoyed with this game for its lack of an expansive Career mode. Quite frankly, to me, the career is there with the open-ended single-player races. What bothers me is the lack of the fundamentals, the very basic and general things that have made Gran Turismo such a superb game. Yes, the physics are great, yes there's a ton of cars and tracks, and yes, despite all of these drawbacks the game is still quite a bit of fun. But this is a game that could've been perfect, it could've been the epitome of handheld to console ports, but instead it continues the age-old pessimism of handheld iterations of console blockbusters being nothing more than stripped down quick-flings. If there was one brand, one developer, one game franchise to end that stereotype, it should've been PlayStation, it should've been Polyphony, and it should've been Gran Turismo.